Davout, after attending the Paris military academy, is in 1788 a second lieutenant, serious with a keen interest in. This son of a ruined family of ancient aristocracy adopts the revolutionary ideas. 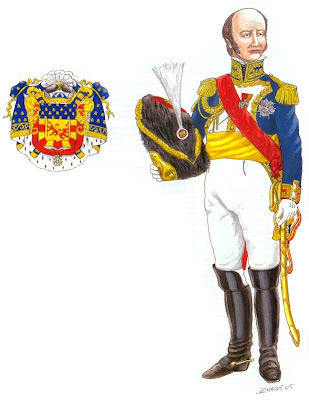 In 1792, He commands a battalion of the volunteers of Yonne in the army of Belgium. He takes part in the battle of Neerwinden, March 18, 1793.When Dumouriez abandons the French Army, Davout goes to his headquarters to arrest him. Dumouriez manages to escape. Davout is sent to the Army of the West and is named brigadier general (June 1793). He refuses his nomination as major general, considering that he lacks the experience for such a function. Prisoner of the enemy, in inactivity or service, Davout remains constant in its objectives of career, to the point to study military treaties. He follows an exemplary career progression in various army corps, binding friendship with Desaix. Who introduces him to Bonaparte in 1798. Davout is part of the Egyptian expedition , commanding a brigade of cavalry of the Desaix division. In 1800, the only General to have refused to sign the capitulation after the departure of Bonaparte, he returns to France in May 1800. He is promoted major general on July 3, 1800. He then takes the command of the cavalry of the Army of Italy, under the direction of the General Brune. In 1801, his marriage with the Aimee Leclerc made him a brother-in-law of Pauline, sister of the Emperor. With the creation of the first Empire, in 1804, he is named marshal. Always at the head of the III corps, he beats the Prussian army of Brunswick at Auerstadt, October 14, 1806, despite numerical inferiority of one three while Napoleon is fighting in Iéna. This decisive stunning victory, initially underestimated by the Emperor, won him the honor to first enter Berlin on October 27, 1806 and the title of duke of Auerstadt in 1808. At Eylau, with his its 14.000 men, he forces the Russian armies to retreat on the right flank . At that time governor of the duchy of Warsaw, he took-back his service of soldier, perhaps irritated by the suspicions of the Emperor about his aspirations to the Poland crown. In Eckmühl in April 1809, the Davout's III corps faces alone the main Austrian army. He takes the initiative of attacking and manages to make it retreat. In Wagram on July 6, he leads a decisive attack. On January 1, 1810, he is a head of the army of Germany, functions which leads him to denounce the fraudulent activities of Bourrienne posted in Hamburg. Davout is then appointed governor of the Hanseatic cities ensuring the good application of the continental system in north Europe. Above all he has to reorganize the Grande Armée (600 000 men!) before the Russian campaign. Davout is persuaded of the madness of this enterprise but, for this soldier, an order is an order. At the beginning of the year 1812, he leaves Hamburg at the head of the Grande Armée I corps. Throughout the campaign of Russia, his I corps is characterized by its behaviour and discipline. In the first weeks of the campaign, he is sent to the south to encircle the Russian army of Bagration. Despite his manœuvers, the plan fails because of the slowness of Jerome Bonaparte, in charge of the right wing of the Grande Armée. In Borodino, his horse is killed under him. He briefly loses consciousness, but quickly takes back his command. Regarded as an iron man, he cries the death of the faithful major general, Gudin, killed in front of Smolensk. During the retirement retreat, Davout I Corps placed in rear-guard manages to contain the enemy attacks. After this campaign, Davout is sent in Germany, to subdue the up risings of the population. He does not apply the orders at letter, being satisfied to requisition the money and the labour necessary to the defense of the fortified towns. In May 1813, he occupies Hamburg. During one year, it defends the besieged city, which he returns only on express command of Louis XVIII. He sends to the new King a letter to explain his behaviour, without receiving answer. When Napoleon returns from the island of Elba, Davout is the only marshal who did not give oath to the King. He is also one of rare to have not been defeated. He is finally convinced to accept the ministry of War. In a few months, he succeeds to recreate an army. When he learns the Waterloo disaster, Davout understands that all is lost. The government delegates him to ask the Emperor to leave the capital. On July 3, 1815, he signs the armistice with the Allies and leaves Paris while making evacuating all the valuable items of the artillery museum. He returns however to defend Ney, put in trial. Deprived of his revenues, he knows a difficult period before finally recovering his titles in 1817 and being admitted to the Chamber of Peers in 1819. He dies four years later. Louis Nicolas Davout, Duke of Auerstaedt, Prince of Eckmuhl, probably the best strategist of Napoleon. As commander of the Guard Grenadier, he wears a rich version of the uniform of his men, with square lapels and gold embroideries and laces. On the breast, the medal of the "Legion d'Honneur" and the "Corona di ferro" (Iron crown) the equivalent Honour Italian medal, so named from the old crown of the Emperor Charles the Great. Orange outlined green ribbon, gold and blue enamel eagle. This medal was given to the distinguished commanders of the Italian campaigns.